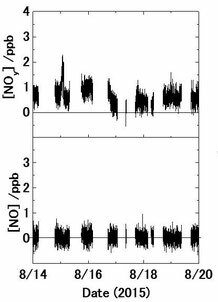 Atmospheric nitric oxide (NO) and total reactive nitrogen (NOy) were measured at the top of Mt. Fuji during the summer in 2015. A primitive result is shown in Fig. 1. The concentration of NO was under the detection limit (0.2 ppb) during the observation period. The concentration of NOy was fluctuated in the rage of 0.5 ppb to 1 ppb during the observation period. Figure 1. Observed [NO] and [NOy] in the top of Mt. Fuji in summer 2015. Upper panel showed NOy and lower panel showed NO.